I've been spending a lot of time playing Total War: WARHAMMER these past few days. I have fond memories of the tabletop version back when I was in high school and, for me, Creative Assembly has done an excellent job of translating that into a video game that captures many of its ideas and mechanics. While not all of the playable races/factions may be present, CA has plans to add at least one more, the Beastmen, very soon. My two favorite armies to play when I was young were Chaos and Undead (now called the Vampire Counts). The ranks of my Chaos Warriors were bolstered by the feral Beastmen and I couldn't help but notice the distinct lack of those units in the Chaos Warriors DLC. Apparently, that was due to Creative Assembly building out a unique campaign for the Cloven Ones. In addition to being able to play as Beastmen in the main Campaign mode, there's a special Story Campaign (called "Eye For An Eye") set on a unique map that will pit Khazrak The One Eye against the forces of the Empire. As far as the actual gameplay mechanics of the race are concerned, it appears they will be a mix between Chaos (they can only sack and raze settlements and their building infrastructure is tied to the Lords) and Greenskins (they have a "Bestial Rage" meter that fills as they engage in combat and, once filled, will summon an A.I. controlled Brayherd to assist you). They also have their own special magic, the Lore of the Wild, to use in-game. 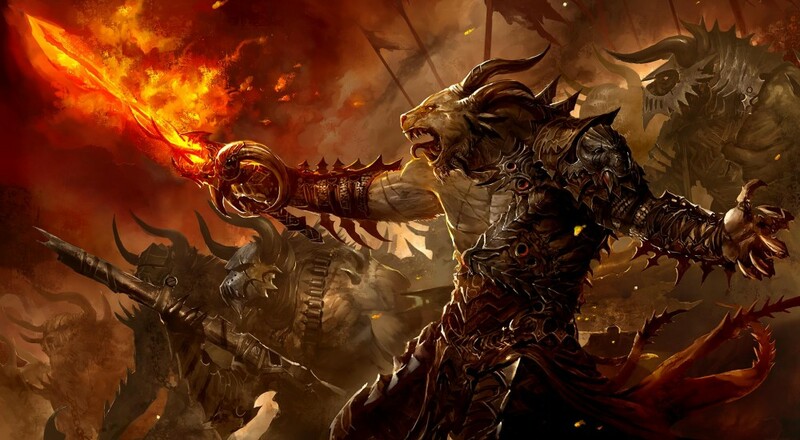 There are some important gameplay mechanics that are introduced with the Beastmen, such as being able to "Raze and Loot" settlements and no attrition between two armies, that actually address some of the issues many players have with the Chaos army, so it will be interesting to see if any of that finds its way over to Chaos itself. The "Call of the Beastmen" DLC arrives next Thursday, July 28. You can pre-purchase it via Steam and get 10% off the asking price of $18.99. Page created in 0.6238 seconds.